I am feeling alone and melancholy tonight. My apologies. In an effort to lift the funk, I will look ahead - actually, for this first aspirational travel post, I will look behind. A true gem of a hotel/B&B/family-owned and -loved business. The owners are cosmopolitan and warm; friendly, accommodating, and inviting; and clearly love this property and what they do. 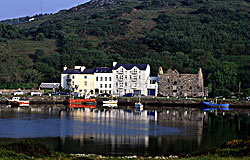 The building is a blend of history and modernity, nestled right on the waterfront and surrounded by beautiful countryside. That being said, it is a quick 2-minute trip to the town center, so location is ideal for its beauty and convenience. The decor is a great mix of traditional and contemporary, with a variety of rooms, arrangements, and views that will suit any traveler. Clientele when we were there ranged from young families (i.e., us) to business folk to older couples. A castle, an abbey, and a world-renowned boarding school for girls - this stunning place has a rich and storied history. 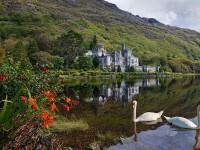 Tucked away in the scenic idylls of Connemara, its grounds also have a traditional Victorian Walled Garden, pond (complete with swans! ), and numerous paths to explore. Tours are given, replete with folklore. Also: every picture you take will be stunning. The natural and manmade beauty are breathtaking here. This relatively non-descript building houses an amazing variety of all things sheep-related. They also host classes, festivals, and events. The throw we purchased during our stop here is one of my favorites - warm, durable, and unique, with great memories woven in. Leave time to drive aimlessly. Follow the coast up north for spectacular views and history around every bend. I can't wait to go back - to revisit familiar places and discover new ones. There, I do feel better now. Wunderbar! *This post is simply the itinerary we created. There is no sponsorship or affiliation, and there is no compensation for this. (In fact, I am pretty sure none of these places know my little blog exists.) All pictures from referenced company-owned websites. 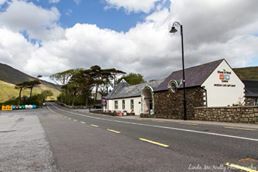 Leenane Sheep and Wool Centre photo is via company's website by way of Linda McNulty Photography. 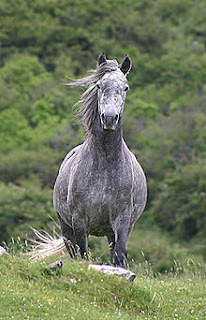 Connemara pony photo courtesy of Wikipedia.org.